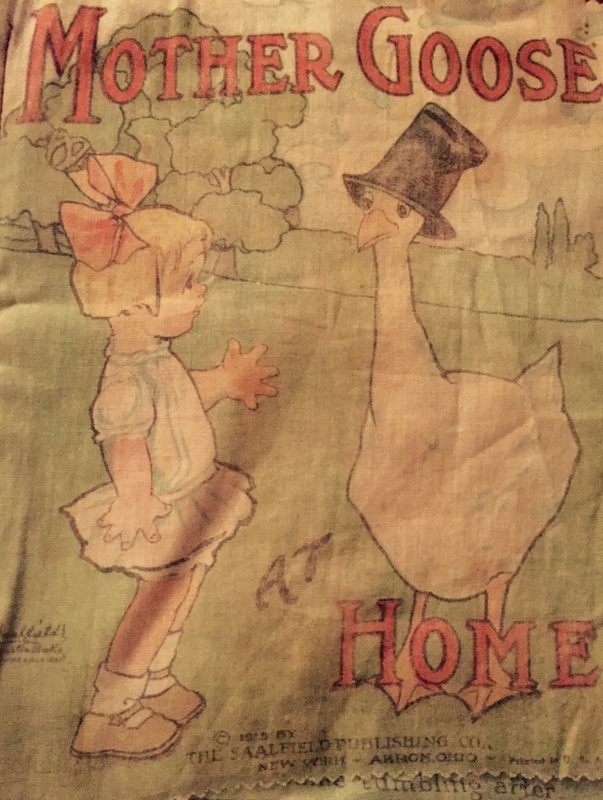 Mother Goose at Home, published by The Saalfield Publishing Co. 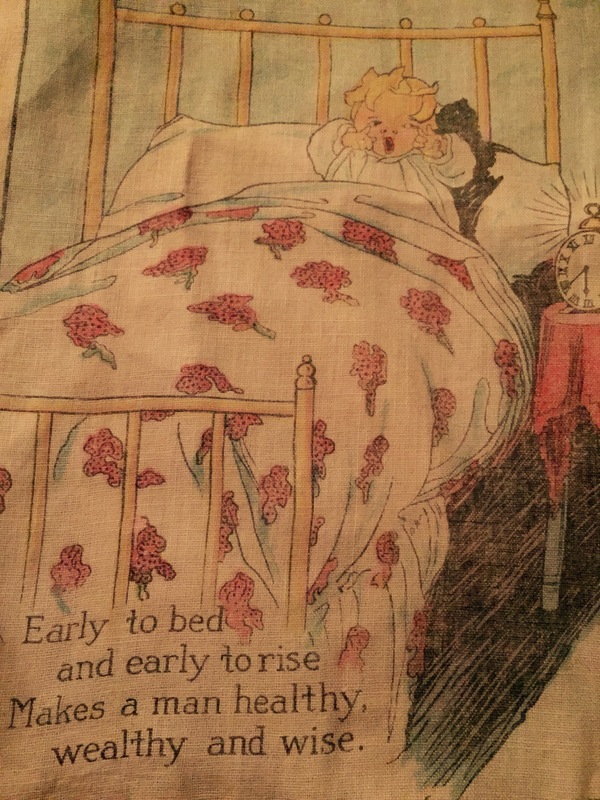 This muslin book was published 100 years ago by The Saalfield Publishing Co in the USA. I wish I had noticed this detail during my grandmother’s lifetime. It was a book from her childhood, but she was born to a refugee family in Aleppo and they moved to Beirut when she was a small girl. How did she come to to have a cloth book from the USA? My grandmother’s Armenian father and Greek mother had found themselves in Aleppo following deportation from eastern Anatolia in 1915. Their first child was born as they were being taken by train towards the the Deir-ez-Zor desert. Amazingly, a guard was unable to enter their railway carriage and so they found themselves continuing on the train to Aleppo instead of disembarking and continuing on foot to Deir-ez-Zor. In Aleppo my great-grandfather was hunted by name, so in my grandmother’s early years her father was living in hiding in an attic. Later, when settled in the Lebanon, he set up major relief programmes for refugees. He was invited to London on several occasions to speak about the plight of Armenians. Perhaps he bought this muslin book for his daughter on one of these visits? My grandmother was a wonderful collector and documenter, but the family moved frequently throughout her lifetime, so she couldn’t keep many possessions. So it surprising that she kept this book – and even more remarkable that she didn’t leave a handwritten note with it explaining its significance, as she did with everything else! I can only assume that this muslin book was a special gift from her father – a happy memory from a traumatic early childhood – and she kept it because it was light and easy to carry. In 1945 she married a British solider, posted in the Lebanon during World War II, and they sailed to England where she lived for the rest of her life. 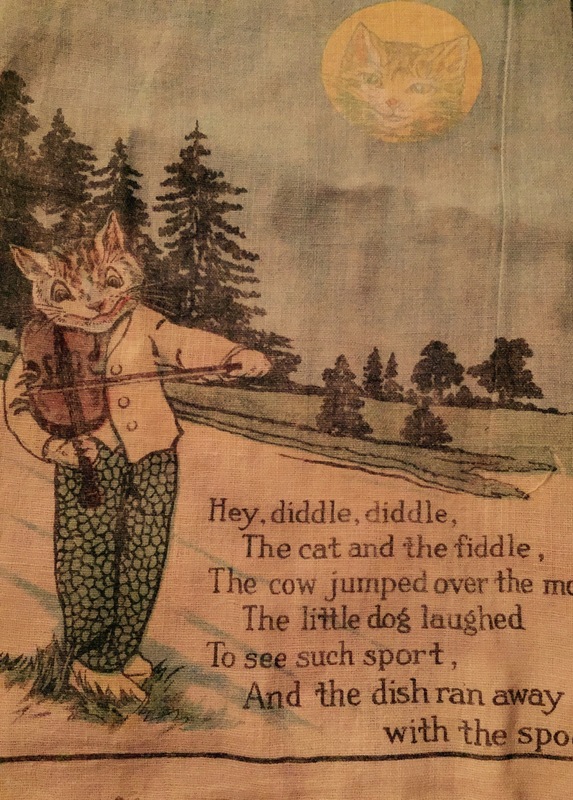 It’s just a simple book of nursery rhymes, but it’s a well-travelled book, and I’m glad to have it at home with me in Hay. The Saalfield Publishing Company published children’s books and other products from 1900 to 1977. It was once one of the largest publishers of children’s materials in the world. The company was founded in 1900 in Akron, Ohio, by Arthur J Saalfield who had come to take charge of the Werner Company’s publishing department. During its flourishing, the company published the works of authors including Louisa May Alcott, Horatio Alger, P. T. Barnum, Daniel Defoe, Colonel George Durston, Laura Lee Hope, Herman Melville, Dr. Seuss, Anna Sewell, Shirley Temple, Johanna Spyri, Mark Twain, Johann Rudolf Wyss, and Robert Sidney Bowen.